In this comedic fantasy gamebook for adults, YOU play the conniving butler to the dark lord, and the choices you make shape the story. With multiple pathways and 9 different endings to discover (not to mention plenty of ways to meet an untimely demise), you're going to have your work cut out for you ensuring the castle runs smoothly. This is Downton Abbey meets Mordor – will you serve-vive? Butler to the Dark Lord is interactive fiction at its funniest, written by stand-up comedian and fantasy author Sam Bowring. Note: The ‘Look Inside’ sample does not work as intended as it only comprises 10% of the text, and gamebooks jump around all over the place. "It’s amazing that Bowring has taken this form of story-telling and used it to tell a fantasy story to an adult audience. It works very well in e-book format because all the choices are hyperlinked to the relevant page – no endlessly flipping back and forth! … There are ribald jokes and double entendres throughout … Malacandros is also a terrifying boss (but sometimes he’s really nice! ), and the atmosphere of the book is danger-filled and darkly humorous." 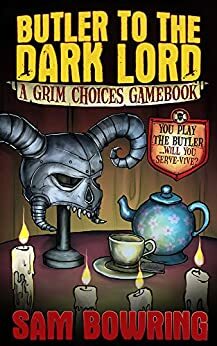 "Even though the intention is clearly humorous and the various scenarios consistently amusing, ‘Butler to the Dark Lord’ is far from merely being a tongue-in-cheek parody of adventure gamebooks. There is a real adventure, which, thanks to the assassination plot, has a decent storyline with a reasonable level of challenge and intrigue … It all makes for a highly enjoyable adventure with a bit of a difference. It’s sure to keep you entertained throughout." Sam Bowring is an author and stand-up comedian living in Sydney, Australia. To see comedy clips or read more of his nonsense, visit sambowring.com. 4.0 out of 5 starsDidn't hate, didn't love. First, I love the game books like Pick a Path, Choose Your Own Adventure, and other books that allow the reader to have agency in the plot. So, I have been picking up these more modern examples to see what is both new and familiar with the genre. This is an interesting example of a modern game book. My first reaction was less than stellar. Flipping through it I wanted more pictures because I love the cover illustration. Also, I was not immediately happy with the formatting of the choices that follow the sections. The kindle version appears to link it nicer than the print version I bought, but options did not stand out enough on first inspection. The first page "instructions" tried to exude atmosphere and mood which made it hard to follow the instructions--but as a veteran of this genre that did not matter much to me. Luckily, I read on to find out how it worked. Like most game books the setting is barely mentioned. The details are sparse. Yet, it does eventually provide choices that propel you into proper Jeeves mentality. I'm not quite sure that this is Downtown Abbey meets Mordor but it is a nice take on "serving" evil. Ultimately, this is a nice modern game book that is fun. I'd read another by Sam Bowring. 4.0 out of 5 starsFun! It was fun, on the first read-through. I look forward to more. I'm so glad that there are choose-your-own-adventure books for adults. This one has some decent humor, the writing's not half-bad, but the choices are what did it for me. You get a lot, and they seem to have further-reaching effects than just 'turn to this page/click this link' (I read this on my Kindle 4 Non-touch). There are consequences for some choices that come into play later on in the story. At least, I think so. Being WELL RESTED is advantageous, at least. Don't really know for the rest of them, but like I said before, I'll be re-reading this making different choices each time. Fun, for sure, and a quick read each time. Took maybe 2 hours to get through the chosen path, going rather slow (distractions and whatnot). I'd recommend it. I only give it 4 stars because the writing isn't superb. It's fine, but it's nothing ground-breaking. Butler to the Dark Lord took me back to the days of my youth when I read the Pick-Your-Own-Path books, only with a darker twist. Bowring intersperses an interesting tale with dark (but light-hearted) humor that is sure to please anybody looking to have an off the beaten path reading adventure. 5.0 out of 5 starsChoose to be bad and feel good about it! I didn't realize how much I missed choose your own adventure books until I read through this the first time, and the second, and the third. Each time trying a different response to the devilish options we were presented. This book is a great opportunity to exercise those darker thoughts. Should you flatter or insult someone? Help or hinder? Sometimes this book rewards you for either, and it's nice to see something good from choosing something so evil. The sense of humor in the book is darkly wonderful and it is great for a quick read, or several quick reads. 5.0 out of 5 starsWhat would an evil butler do? I loved 'Choose Your Own Adventure' books when I was young. It's great to read one as an adult where you can get drunk repeatedly, have your way with a virgin and tell your evil master what you really think of his fashion sense. In 'Butler to the Dark Lord' a horrifying death is just as much fun as succeeding to live with all your organs intact.There is quite a bit of story within, with great character development driven by the choices you make as the butler. It feels like an adventure again and again and is more like reading five books than one.